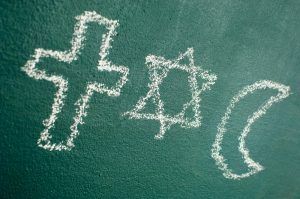 Do Christians Muslims and Jews worship the same God? It was a rather grey and unremarkable Saturday afternoon at our Baptist training college. But being asked a question like this can make a dull day memorable. 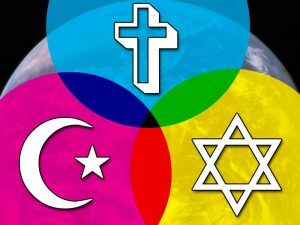 Do Christians Muslims and Jews worship the same God? asked our tutor. So, we scuttled off into those bothersome small groups as one is expected to do, and, if I remember rightly, we all came back with pretty much the same answer. The answer that felt right, and was theologically “politically correct”: Christians and Jews worship the same God, Yahweh of the Old Testament, but Muslims do not. Easy peasy! “Are you certain?” he says. “Oh yes, pretty certain” we reply (suddenly feeling less certain). “Well”, (glancing around for reassurance), “for a start Muslims don’t believe that Jesus is God”. Sometimes you must unpick an idea in order to reconstruct something more robust. That’s what I want to do here. Questioning our inbuilt assumptions and prejudices may be particularly poignant as we see renewed levels of violence between Muslims and Jews in Gaza, and see no let‐up to extremist religious terrorism in Europe. Do Christians, Muslims and Jews SEEK the same God? Think about this before reading on. Any devout seeker of God is seeking the one true God. That may seem obvious but sometimes we need to state the obvious. So, it seems that God may reach people in ways we would not expect. Salvation is only found in Jesus Christ, (Acts 4.12): “… there is no other name under heaven given to men by which we must be saved”. I believe that, but I can’t limit the ways in which Jesus chooses to work, the ways he chooses to reach people. That shouldn’t surprise us. After all, nobody in the Old Testament called on the name of “Jesus”, and yet we understand there is salvation for Abraham for Moses, for Job. Moreover, many would consider that today God may somehow apply the work of Christ for example to infants who die before they have a chance to ever articulate the name of Jesus. OK so Christians, Muslims and Jews seek the same God, and this one God may hear their prayers or respond to their acts of kindness as he chooses to do – rather than what you or I tell him to do. So do we in fact all worship the same God, albeit with different names? Interestingly many Muslims believe we do worship the same God. They say that Christianity is a corruption of the one true faith which Islam corrects. They say Jesus was born of a virgin, he was a revered prophet but he was not God and he did not die on the cross (despite evidence even from secular scholars that he did). But from our (Christian) perspective there remain major differences between Christian and Muslim depictions of God. The “what” and “who” of the one God we both seek is different. Yes, we seek the one true God as do Muslims (the “what”), but “who this is” is not the same. The person of God characterized in the Bible turns out to be a very different to the person of Allah characterized in the Koran. Allah and Yahweh turn out to be different people. And the claims of Jesus are also sufficiently different that they do matter. There are major differences on salvation, sin and eternity amongst others. 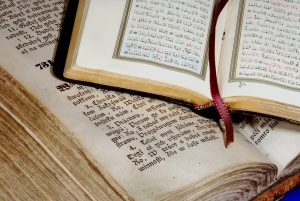 Whereas we can regard Jews as having a true but incomplete revelation of God, there remain major discrepancies between Christian and Muslim understandings of who this God is. But hang on! So after all that hard thinking we’re back to the rainy Saturday afternoon with the answer we started with? It matters because our God is bigger and more complex than we imagine. He will not be boxed‐in to your or my limited understanding of how He must behave or who he must listen to. Jeremiah 29:13, “You will seek Me and find Me when you seek Me with all your heart”. Thanks. I think it’s also worth pointing out that the majority of the non believing public DO think we all worship the same God. We need to deal with that well. An excellent, well developed article Chris; thank you. It mirrors much of my own recent thinking, some of which may be the subject of my next book (if it ever gets that far!). I have read the thread on the Premier site, and noted the arguments. I wonder if approaching from the perspective of inate practice, rather than religious belief, might help further understanding? Hmmm. Confused. “Inate practice” meaning simply what we do eather than anything we believe? So “what if are all worshiping a false God who nevertheless is himself generous to us” ? .…. That needs some unpicking! They all seem to have different imaginary friends! Thanks for reading and commenting Neil!